QuoVadis Mobile is your “All-Inclusive-App” for navigation and GPS. Easy to operate and omnipresent on your Windows Phone 8, it satisfies all your needs. For everyday navigation, e.g. for shopping in the city, a weekend trip or a hiking tour, QVM often makes the usage of a separate GPS navigation device obsolete as it offers all necessary GPS functionality. And for spontaneous actions it is always on board anyway. You may share your own position with others. Likewise, you may follow the locations of others in real-time if they have shared them. This is ideal if you are on a hiking trip as a group or in an unknown city and you are interested in the whereabouts of your fellow travelers. Technically, this is implemented using your private SkyDrive folder enabling you to control access to your data. For this feature to work, an Internet connection is necessary. In the case of an emergency, you are able to send your location in an SMS text message or an email with just two clicks. 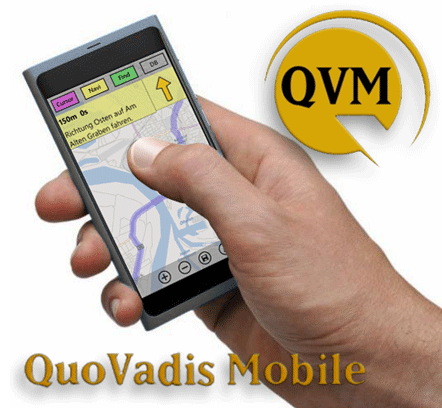 QVM uses the so-called and freely available here-maps for basic and on road navigation. These maps may be downloaded for individual countries and may then be used offline, i.e. without an active Internet connection. In addition, online maps such as OSM, GoogleSat, BingTraffic and OpenWeather may be used. Most of these online maps are ready to be used, others can be easily added. If you are a QV user, you may export any map from QV and use it offline in QVM which gives you offline access to a virtually unlimited set of maps. Like in QV, QVM uses an internal database to manage your data. Thus and despite of the amount of data involved, this means your data is constantly displayed in a structured manner and a powerful search function as well as definable favorites allow you to easily find what you are looking for. Search in the famous portal GPSies and then let the track routes using “Track Navigation”. If you want to, you may create additional databases and reorganize your data using copy & paste operations. If you are on a tour, you may create maps, generate tracks and an arbitrary number of waypoints. Feel free to assign custom-made attributes like colors and symbols. Furthermore, each object features an information field allowing you to enter additional information or a more detailed description. All data can be stored in GPX format such that it can be imported and exported to or from other programs. Coordinates may be entered or read in Wgs84 Lat-Lon or UTM format. QuoVadis Mobile is available in the Windows Phone app store. There is also a trial version available such that you can test all features prior to purchasing the full version. * An Android version will be available in the spring.